Session 1: Learn the basics of needle tatting which will include making a double stitch, and picots to form a ring, and then learn how to travel with a thread and join rings. With these basics, students will make a simple snowflake. Patterns for the snowflake and simple edgings and butterfly will be provided. Learn how to read a tatting pattern. 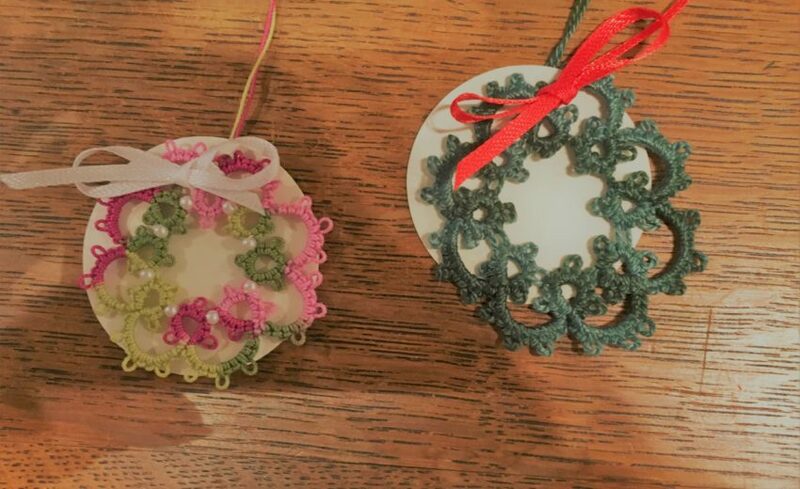 Diane will also demonstrate the difference between needle tatting and shuttle tatting and share the history of tatting and her personal story. The kit will include a #5 tatting needle and #5 perle cotton. A selection of colors will be provided. “Homework” for the second session will be to wind a skein of thread onto a thread card which will be provided. Session 2: Working with a needle and a ball of thread, learn how to connect rings using a chain. Make a small heart using the provided pattern. Diane will demonstrate 3 ways beads can be added to tatting and share some of her shuttle collection. Additional patterns using chains will be available. If you ever tried shuttle tatting and failed, needle tatting makes the process of tatting easier to accomplish. Anyone who knits or crochets can usually learn needle tatting. Bring scissors. Bio: Diane has been teaching needle tatting for over 20 years. Her mother tatted with a shuttle and could never slow down her hand movements enough to teach Diane or her daughter to tat with a shuttle. Diane owned 6 shuttles and numerous books on tatting, and considered herself a “tatting flunky.” She owned and operated Diane’s Design in East Petersburg for 10 years, and it was at one of her buyer’s shows that she discovered needle tatting. It was like a dream come true and needle tatting became an instant hit at her shop. She began teaching needle tatting to people who wanted to tat, but could not master the shuttle. At that time, Diane was a member of the Embroiderer’s Guild and the International Lace Maker’s Guild. It was several years later when Diane went to a tatting retreat (with her tatting needles in hand) taught by Rosemary Peel from England that she finally learned to tat with a shuttle. Rosemary told her, in a very British accent, “You can’t tat this with a needle.” But, Diane managed to do it with her needle and, as a bonus, learned to shuttle tat!